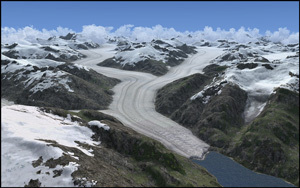 FSAddon Publishing  has released a completely rebuilt version of their Tongass Fjords  title for Microsoft Flight Simulator X . 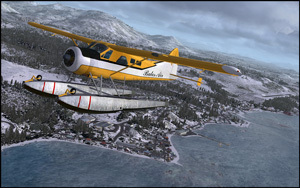 It again is a major cooperation between Holger Sandmann and Bill Womack, including the already legendary ‘Sandmann Landscape’ and also some true-to-life regional airports such as Sitka and Petersburg, the town of Petersburg and quite a few other settlements, airports, seaplane bases and harbors. Fully compatible with Ultimate Terrain and also with most other FSX titles for the region that have been released up till now, Tongass Fjords X brings you a whole new FS world – an addition to Microsoft’s Flight Simulator X that will turn approximately 80 000 square kilometres of Southeast Alaska and northwestern British Columbia into the beautiful piece of nature that it really is. You get a flying environment that puts you in the pilot seat flying around some of the most stunning landscapes you may find in the real world. 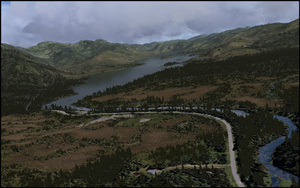 You not only get the actual coast lines, lakes, islands, roads, rivers and glaciers installed on your FSX, but in addition some very talented people have added “things to see and things to find” for you in that rugged area of fjords, mountains, lakes and sea. You will be able to visit many of the US Forestry Service cabins used by hunters, fishermen and hikers hidden near the many lakes and fjords. These cabins are meticulously recreated by Bill Womack, who also recreated Sitka and Petersburg airports as well as landmark objects of Sitka and along the Sitka and Petersburg harbour front. The developers have added moving ships and boats, created by Mitsuya Hamaguchi and Larry Silsbee in many different locations, not just in harbours. Spot and then follow them with your Beaver! • The eastern British Columbia portion of Tongass Fjords by about 8,000 square kilometers to include the Spectrum Range and areas around Bob Quinn Lake airstrip (CBW4). Previously, flying from Telegraph Creek south to Bronson Creek would mean looking out over the default landscape; that’s no longer the case and it is now a beautiful area well worth exploring. • Four additional unlisted airstrips have been added in the British Columbia mountains: two mining strips at the proposed Galore Creek mine, one mining strip at Schaft Creek, and a small airstrip at Yehiniko Lake. All four airfields have unimproved, sloped runways with dirt or gravel surfaces. See the list of “Destinations” for their location or select the corresponding flight situation included with Tongass Fjords X. • Probably the most obvious improvements are the 17 local photo-real areas that cover settlements and bays inside the Tongass Fjords X coverage area. Using 1-m aerial imagery allowed the developers to place buildings and structures in their correct locations and also highlight the beautiful mudflats and tidal areas that cannot really be portrayed with generic textures. Each photo-real area includes all seasonal variants as well as night lights, and blends seamlessly with the surrounding landscape.